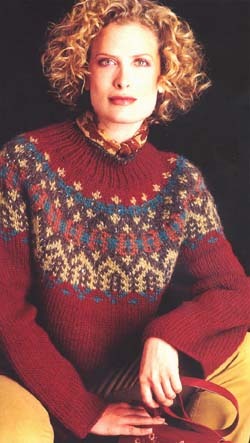 This loose fitting, Fair Isle yoke pullover design is rated for intermediate knitters. Made using Lopi yarn it was designed by Norah Gaughan and appeared in the Fall 2002 issue of Vogue Knitting magazine. Yarn kits with and without needles are detailed below. The Pattern for this design is not included in the kit and can be purchased separately by ordering the the Fall 2002 issue of Vogue Knitting magazine which we can also add to your order.